Tired of pricey subscriptions for your video and web conferencing solutions? Frustrated with spotty connections and poor video quality ruining meetings? At Commworld, we offer high quality, reliable conferencing solutions without a monthly minimum charge – just pay for what you use! Communication is much easier with a stable and quality connection. We can’t promise that every attendee will join the call right on time (somebody is always late), but once the meeting starts, our solution from Confertel will ensure a smooth connection. Enjoy face-to-face conversations, no matter where each of you is located. 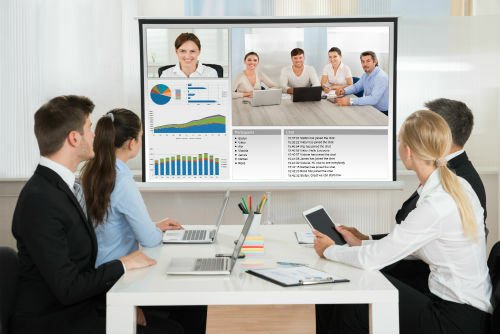 In addition to normal video conferencing, we also offer the ability to conduct webinars with interactive presentation and collaboration features. Save on training costs by conducting company-wide training sessions online. Attendees can easily dial in during the webinar and then review the recorded content again later. Interested in improving communications and training? Get a special offer of 300 free minutes when you sign up with Commworld!